GenericIAM.org BLOG: RBAC first – ABAC next, or what? This BLOG is devoted to the work of the GenericIAM community. We aim at carving out generic processes for the discipline of Identity- & Access Management in order to ease life of all forthcoming implementors. RBAC first – ABAC next, or what? Recently, at a customer’s site, I heard an enlightening response to a simple and straightforward question. The answer left me wondering whether there is a logical sequence in which to implement an access model according to the ABAC approach: first RBAC then followed by ABAC? Indeed, while researching literature I found some proposed or perceived evolution paths, like the one illustrated in the graphic above (e.g. here:, also conveying the promising news that XCML support all of these models) here . However, why couldn’t it be the other way round? Or can’t we have both at the same time, as roles are a good idea. But the dynamic access control, which often comes in the wake of attributes, might be very beneficial as well. What’s about a blended model, having the best of both worlds? 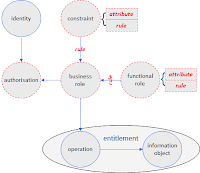 Role based access control (RBAC), as defined in the US standard ANSI/INCITS 359-2004, Information Technology, controls all access through roles assigned to users. Each role assigns a collection of permissions to users. Herby RBAC assumes that, in most applications, permissions needed for an organization’s roles change slowly over time, but users may enter, leave, and change their roles rapidly. RBAC meanwhile is a mature and widely used model for controlling access to corporate information. To cope with its early limitations, inheritance mechanisms have been introduced, allowing roles to be structured hierarchically. So some roles may inherit permissions from others. 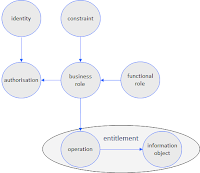 Intuitively roles are understood as functions - or bundles thereof - to be performed within a corporation. Not surprisingly they offer a natural approach to express segregation-of-duty requirements, where no single individual may be assigned all functions for critical operations such as expenditure of funds. It is evident, that roles are global to a given context by their very nature. Proper operation of RBAC hence requires that roles fall under a single administrative domain or have a consistent definition across multiple domains. 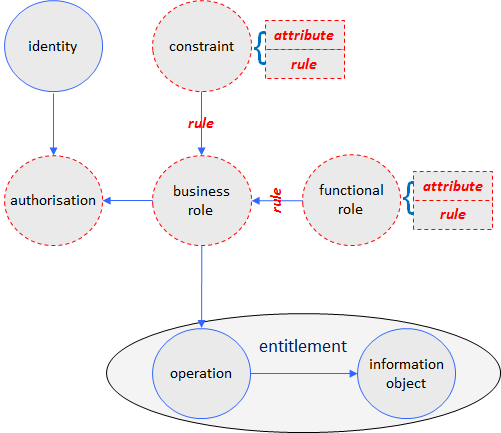 In contrast employing distributed role definitions may become challenging. But not all permission determining dimensions are functional. What is about location, legal entity, customer group, cost centre and the like? Those ‘attributes’ in conjunction with the job function span a multidimensional vector space. A Point in this space defines the package of permissions. 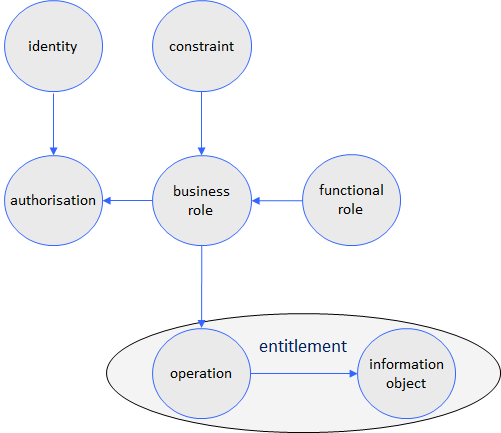 Business roles must be mapped to entitlements. Business roles may be statically generated. They may be determined dynamically at run time. Of course, if the only tool, you have at hand is a hammer, all the world may look to you as a nail – or a variety of them. And so the inevitable happened and roles, with their functional nature, were abused for the assignment of any bundle of permissions, quickly leading to the well-known role explosion. The device in use might limit, what someone is allowed to do. Some devices like tablets or smartphones might be considered to be less secure than others. The location the identity is at, when performing an action. Mobile, remote use might be considered less secure than access from within the headquarters. The current status of a system based on security scans, update status, and other “health” information, reflecting the attack surface and risk. The strength, reliability, trustworthiness of authentications. You might require a certain level of authentication strength to apply. Otherwise you might want to restrict access in a certain way. Traders may not be allowed to trade in their vacation. Mandatory time Away (MTA) is commonly used as a detective / preventive control for sensitive business tasks. It is evident, that static role models cope badly with such dynamic requirements. To avoid “role explosions” and to provide for a higher agility, several attempts have been made. 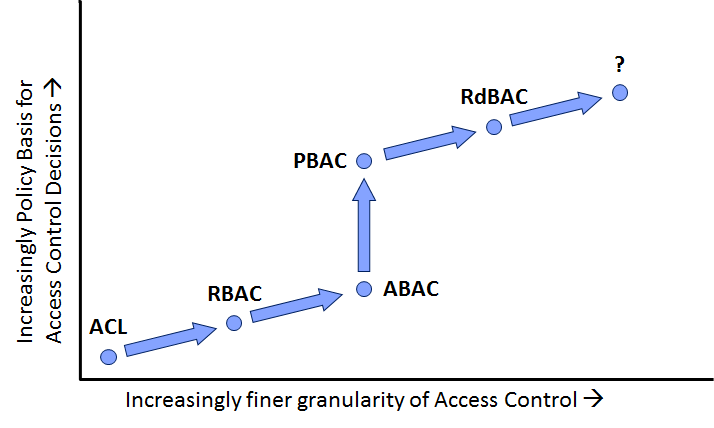 Likewise recent interest in attribute-based access control (ABAC) suggests that attributes and rules could either replace RBAC or make it more simple and flexible. The attribute-based access control (ABAC) model to date is not rigorously a defined approach. Its central idea expresses that access can be determined based on various attributes presented by a subject. These contemplations can be traced back to A.H. Karp, H. Haury, and M.H. Davis, “From ABAC to ZBAC: the Evolution of Access Control Models,” tech. reportHPL-2009-30, HP Labs, 21 Feb. 2009). Hereby rules specify conditions under which access is granted or denied. A bank might allow access if the subject is a teller, working during the hours from 7:30 am to 5:00 pm, or the subject is a supervisor or auditor working those same hours who also has management authorization. This approach at first sight appears more flexible than RBAC because it does not require separate roles for relevant sets of subject attributes, and rules can be implemented quickly to accommodate changing needs. The trade-off for this flexibility is the complexity introduced by the high number of cases that must be considered. Providing attributes from various disparate sources adds an additional task. Attributes may stem from different sources with different reliability resulting in different trust we place in them. ABAC (sometimes referred to as Policy Based Access Control or PBAC or Claims Based Access Control or CBAC) was proposed as a solution to these new issues. As it evolved it was also called Risk Adaptive Access Control (RAdAC). As the model and its application are still emerging, there is currently no widely accepted ABAC model as there are for DAC, MAC and RBAC. Although considerable literature has been published, there is no agreement on what ABAC exactly means. It is however safe to state, that attributes and policies (made of rules) are used in ABAC to derive access decision. As those attributes my change during run time, the ability is assumed to perform these policy decisions at runtime too. As discussed above, both approaches RBAC and ABAC have their specific advantages and disadvantages. RBAC trades up-front role structuring effort for ease of administration and user permission review, while ABAC makes the reverse trade-off: it is easy to set up, but analysing user permissions can be problematic. This insight comes less as a surprise, if we start viewing both models as incomplete fragments, just projections of some richer model. And in fact, rarely does any organization use a pure RBAC or ABAC approach. Typically attributes augment or parameterise roles. They can be used independently to assign basic resources to digital identities, which are not linked to functions performed within the organization. This view supports the strong impression that the discussions of RBAC vs ABAC tend to search for the right answers to the wrong question. It would rather make sense to ask how much R vs. A should be taken to our xBAC model to best serve our needs. Coming to the above conclusion it is not surprising to find that the ‘inventors’ of RBAC themselves come up with even three different suggestions how to combine RBAC and ABAC. Dynamic roles. Attributes such as time of day are used by a front-end module to determine the subject’s role, retaining a conventional role structure but changing role sets dynamically (R. Fernandez, Enterprise Dynamic Access Control Version 2 Overview, US Space and Naval Warfare Systems Centre, 1 Jan. 2006; http://csrc.nist.gov/rbac/EDACv2overview.pdf). Some implementations of dynamic roles might let the user’s role be fully determined by the front-end attribute engine, while others might use the front end only to select from among a predetermined set of authorized roles. Attribute-centric. A role name is just one of many attributes. In contrast with conventional RBAC, the role is not a collection of permissions but the name of an attribute called role. This approach’s (IEEE Computer, vol. 43, no. 6 (June, 2010), pp. 79-81) main drawback is the rapid loss of RBAC’s administrative simplicity as more attributes are added. It also suffers from potential problems with ABAC when determining the risk exposure of a particular employee position. However this 2nd scenario could serve as a good approach for a rapid start, generating early results in automatic the assignment of all those permissions, which can be granted without having deeper knowledge of the digital identities job function. Role-centric. Attributes are added to constrain RBAC. Constraint rules that incorporate attributes can only reduce permissions available to the user not expand them. 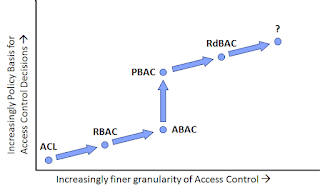 Some of ABAC’s flexibility is lost because permission sets are still constrained by role, but the system retains the RBAC capability to determine the maximum set of user-obtainable permissions. As an aside, developers explicitly designed the formal model for RBAC, introduced in 1992, to accommodate additional constraints being placed on a role. This approach by the way is the one envisioned as the natural approach by KuppingerCole ). Roles & constraints can be deployed dynamically too. Entitlements and identities remain static at the same time. Having said all this, we can safely conclude that sticking with one model in its pure breed will limit our expressive power and lead to suboptimal results. There should be less the question whether we have a preference for the A or the R in the respective xBAC-model. But rather we should decide on how much of each to be introduced at what point in time. Even a combination of the three approaches as mentioned in the above chapter may not lead to model degeneration but would rather have the potential to lead to an optimal model. A. Pimlott and O. Kiselyov, “Soutei, a Logic-Based Trust-Management System”, FLOPS 2006, 8th International Symposium on Functional and Logic Programming.,Fuji-Susono, 12 Japan, April 24-26, 2006. Also in Springer's Lecture Notes in Computer Science 3945/2006, pp. 130-145. Anderson, A. 2004. XACML Profile for Role Based Access Control (RBAC). Anderson, R.J. 2001. Security Engineering: A Guide to Building Dependable Distributed Systems. New York: Wiley Computer Publishing. Barkley, J.F. (no date). “Workflow Management Employing Role-Based Access Control.” U.S. Patent #6,088,679. Barkley, J.F. 1995a. “Application Engineering in Health Care.” Second Annual CHIN Summit. Chicago, IL..
Barkley, J.F. 1995b. “Implementing Role-based Access Control Using Object Technology.” First ACM Workshop on Role-Based Access Control. Barkley, J.F., and A.V. Cincotta. 1998. “Managing Role/Permission Relationships Using Object Access Types.” Third ACM Workshop on Role-Based Access Control, Fairfax, VA.
Barkley, J.F., and A.V. Cincotta. 2001. “Implementation of Role/Group Permission Association Using Object Access Type.” U.S. Patent No. 6,202,066. Barkley, J.F., A.V. Cincotta, D.F. Ferraiolo, S. Gavrila, and D.R. Kuhn. 1997. “Role-based Access Control for the World Wide Web.” 20th National Computer Security Conference. Barkley, J.F., D.R. Kuhn, Rosenthal, Skall, and A.V. Cincotta. 1998. “Role-Based Access Control for the Web.” CALS Expo International & 21st Century Commerce 1998: Global Business Solutions for the New Millennium. Bednarz, J. 2005. “Compliance: Thinking Outside the Sarbox.” Network World. As obtained on 10/31/2008. Bertino, E. and R. Sandhu. 2005. “Database Security—Concepts, Approaches, and Challenges.” IEEE Transactions on Dependable and Secure Computing 2(1): 2-19. Bokhari, Z. 2009. Standard & Poor’s Industry Surveys, Computers: Software. (April 23) and company Web sites. U.S. Code 44 (2006). Information Security, § 3532 (b) (1).. Accessed February 5, 2009. Bureau of Economic Analysis. 2009. “National Income and Product Accounts: Table 5.3.5. Private Fixed Investment by Type.”. Accessed April 14, 2009. Byrnes, C., Vice-President: Services and Systems Management, The META Group. June 13, 1997. “Security Administration Grows Up.” An analyst report produced for Tivoli, an IBM company.